SMIDGE OF THIS: Christmas Ornaments: Our Blogger Swap + My Faves! One of my most favorite parts of the holiday season is delicately unwrapping all of our Christmas tree ornaments and displaying them on the tree. And moving all ornaments that Ian hangs up to other, more appropriate, areas of the tree. Ahh, bliss. I don't really have too many "filler" ornaments ... all of mine have been collected over the course of ten or so years and I usually treat myself to a few each year and receive some additional ones from girlfriends and family members. One might say that I like ornaments with ... panache. Here are some of my favorites that are in stores now! It's so nice to have an ornament tied to special memories which is why I absolutely love the diamond ring ornament above. It's currently on sale for $24, so a bit more than I would typically spend on an ornament, but I think this is a really cute gift idea for a girlfriend or sister who is newly engaged or married. Ballet was a big part of my life through my junior year of high school, so the most expensive ornament above, the Christopher Radko nutcracker ornament for $59, is definitely a splurge, but this would be treated as a true keepsake and would deserve a special spot on the tree or maybe just an ornament stand. The rest of the ornaments listed are in the $4-8 range -- now that's my real style. As you very well know. 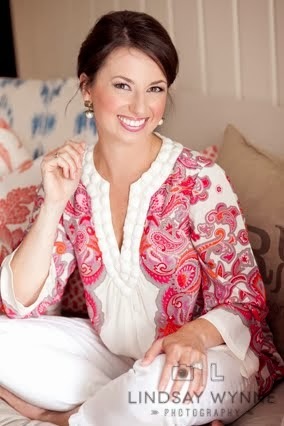 Last night Classic Annie was so sweet to host a large group of Charlotte bloggers at her home for an ornament swap! Her house smelled fantastic (a reminder to me to purchase another Nest holiday candle!) and it was decorated so lovely for the holidays. Here I am with Dee. Thank you to sweet Mindy for bringing some Fre non-alcoholic wine so I could partake with the other ladies! We split into two groups to do the ornament swap due to how many girls we had there! It was so much fun unwrapping new presents and stealing ornaments from each other. ;) All in good fun! The ornament I ended up with, which was no easy feat mind you, is adorable. This puppy was opened by someone, stolen by me, stolen from me, later stolen back by me (and there's the three steals -- meaning, it was now mine!). The first thing I did last night upon getting home was walk it straight over to the tree! Beautiful ornaments and crazy fun girlfriends ... you can't get a better mix. I hope your holiday is filled with both! How fun! I love ornaments too and slowly collect meaningful ones through out the years. What a fun party! The state ornament is so cute!!! I am loving the ring in the box ornament it really would be perfect for an engagement gift! You and your panache :) Stylish and adorable!! And I love that you included a pickle ornament - our family does the "pickle prize" tradition and it's so much fun! Great seeing you last night, beautiful! I want to come to a Charlotte blogger meet up ;) Fun! It was so great seeing you last night! You are just GLOWING and looks so fabulous. I'm glad you loved the ornament...I definitely need to order one for myself now! I love this post! The West Elm ornament is my favorite. I love the idea of a Christmas ornament swap! Great seeing you! You look adorable! Hope some of those clothes work for you! What a fun party! Crate and Barrel also has fantastic ornaments. I always hit them up after Christmas for a great deal on them. So nice to finally meet you last night! You definitely walked away with such a beautiful ornament! Growing up my mom would always make us exchange ornaments with our friends as our Christmas gifts. At the time I hated it! Who wants a boring ornament?! Um, grown up me! Now I love all the ornaments I have from growing up! And I love adding to our collection with special ornaments each year! This year we get to add a first married Christmas ornament! That ornament is precious! A blogger ornament swap is such a great idea! Looks like so much fun! Love this idea!! And that ornament you ended up with is perfect. Do you know where it came from? I know Dee through my friend Patra in (I Do Declare Blog). Small world! Love the ornaments and the steal the gift idea. Looking good, Sister. Have a great day! 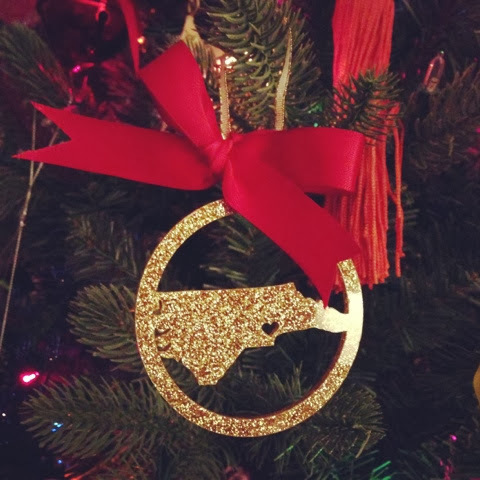 I LOVED your ornament, I think I need a NC ornament for my tree, and with glitter it's even better!